Volunteers are needed to join the PoD team in Nepal to provide fun and exciting activities within schools, nurseries, orphanages and our street children’s centre in the Himalayan city of Pokhara. Fun and interaction through music, drama and arts allows the children in Nepal to have the opportunity to develop new talents and improve their self-confidence. The schools and centres in Nepal have very limited resources so are rarely able offer creative art options so any additional support from volunteers is greatly appreciated. Creative arts are a fantastic tool to help the educational development of children from difficult backgrounds. You can help make a difference to the children by bringing imagination and creativity plus the interaction with foreign volunteers will naturally improve the children’s English skills and confidence too. All PoD Nepal volunteers can also join our PoD Friday volunteering group where we organise for the team to volunteer in Pokhara led by Chrissy, our PoD volunteer manager. Volunteers in Nepal are able to develop creative arts projects specific to their own skills, whether it be art, music, drama, crafts, creative writing, storytelling, dance, puppetry; the list only limited by your imagination! Volunteers usually work five days per week for around five hours per day. Volunteers in Nepal arrange activities during the day at schools, child care centres and nurseries and after school and holiday sessions at the street children’s centre and orphanage. Volunteers should come prepared with ideas for activities suitable for children of different ages. Past volunteers have been involved in a range of activities including given singing and music lessons in the schools, finger painting, created a pop-up story book, crafted dance workshops and produced plays. Volunteers receive a Nepali language lesson in their first week in Nepal. There will usually be between 2 and 5 PoD volunteers in Pokhara at the same time as you. PoD has been working with the projects in Nepal since 2007 and we support them through volunteers as well as financial support through the PoD Charity. PoD has two members of staff who are based in Pokhara. Chrissy is our volunteer manager; she is the first point of call for volunteers and she will be there to support you throughout your time at the project. 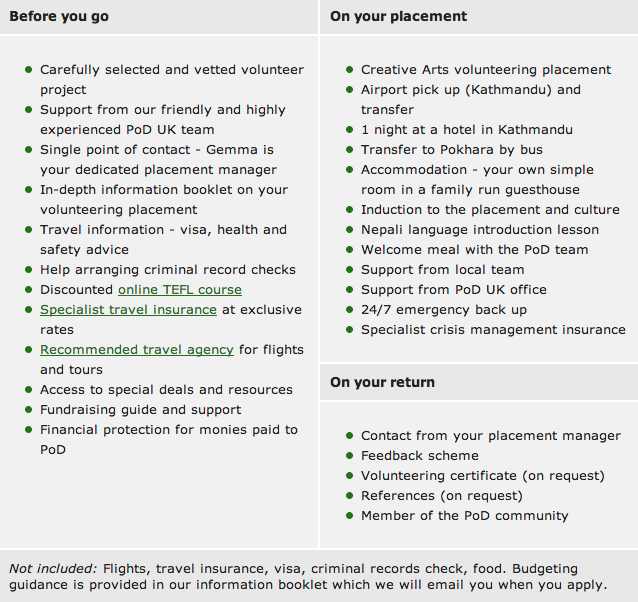 Phil is our local Nepali placement manager and he will introduce you to your volunteer project placements. The PoD team support your work through regular team meetings and by being available for informal one to one support when needed. The Street Children's Centre rescues children from a life on the street. The children here could have run away from home, been abandoned by their families or have grown up on the streets as orphans. The centre is a warm and friendly place and the house mother loves having volunteers over to help her entertain after the many children. The orphanage is home to around 15 orphaned and disadvantaged children between 2 and 15 years old. The orphanage uses its limited resources to provide the children with accommodation, food, education and support. The child care centres allow low to middle income families to work while their children are at a day care centre in a safe and secure environment. The nurseries and community schools are all government funded and have very limited resources. Creative arts volunteers in Nepal will be based in Pokhara which is a beautiful city in the Himalayas situated by a tranquil lake. Volunteers live in the area of Lakeside which is in close proximity to restaurants, internet cafes and shops. This project location is ideal for those wanting to relax and admire the surrounding mountains and is also perfect for anyone wanting to explore the Himalayas after their time volunteering. Pokhara is the base for many adventure activities including paragliding, white-water rafting, kayaking and trekking.